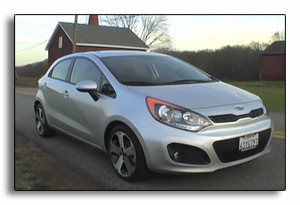 MPG-o-Matic 2012 Kia Rio Five Door Review Summary: If there’s one word to describe the 2012 Kia Rio 5-door, it’s “value.” In the old days, folks referred to inexpensive fuel-efficient hatchbacks as “economy cars,” and they were spartan and rarely attractive affairs. The Rio turns that notion on its head with an abundance of style and features at a base price starting under $14,000. The Rio is equipped with a direct-injected DOHC CVVT 1.6-liter inline four-cylinder engine producing 138 horsepower (HP) and 123 foot pounds of torque. A six-speed manual transmission is only available in the base LX model. A six-speed automatic with overdrive is optional in the LX and standard in both the EX and SX. The automatic transmission features a manual shift mode. The top-of-the-line 2011 Kia Sorento SX delivers a remarkable amount of bang for the buck. Competitors in the three-row crossover segment may have a tough time matching the Sportage SX feature-for-feature, without enduring the sticker bloat of option packages. MPG-o-Matic 2011 Kia Sportage EX AWD Review Summary: The aggressively-styled 2011 Kia Sportage stakes out a bold space in the highly competitive five-seat crossover market. Sharing its platform with the Hyundai Tuscon, the Sportage plays the design card, and trumps the competition with features for the dollar. This one is stuffed with all the goodies, in a quest to one-up the Honda CR-V and Toyota RAV4.